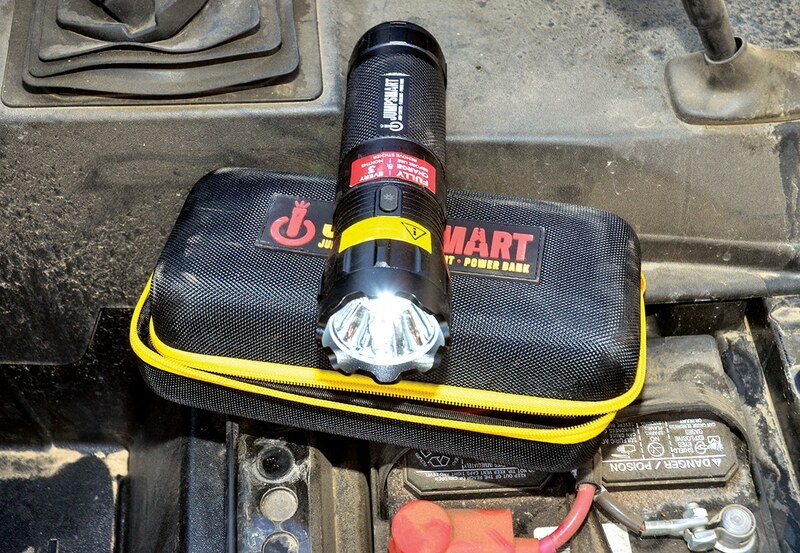 Limitless Innovations introduces the JumpSmart, which combines a four-mode LED flashlight, 5-volt power bank and 12-volt vehicle jump-starter into one compact package. The JumpSmart serves many purposes for the off-road explorer and UTV owner—from charging phones, GoPros, iPads and other devices to lighting up the night and jump-starting UTVs with drained batteries. The JumpSmart has four flashlight modes and a 5-volt, 2.4-amp USB port for charging most devices. Check it out at www.jumpsmart.com. The JumpSmart is a large LED flashlight (8.5×2.0x2.5 inches) with a rubber end cap that protects the on/off switch, USB port, 12-volt power cable ports and indicator lights. The four-mode, 1100-lumen LED light is powered by a 10,000 mAh, 37,000 mWh lithium polymer battery. The LED throws light almost 500 feet (150 m) on high, plus it has low and two strobe modes for emergency signals. It also has a 5-volt, 2.4-amp USB port, and the kit includes jumper cables with 10 built-in safety features, safety-check lights and alarms, 12-volt car and 110-volt wall-charging cables, a protective sleeve and heavy-duty case with a tote handle. It also comes with a 24-page user manual. The JumpSmart is tough, with an aluminum heavy-duty flashlight body with knurled and textured sections for a sturdy grip. The aluminum bezel has a castle crown, so the JumpSmart can be used to disorient or incapacitate would-be attackers. A rubber end cap peels back to reveal the controls and ports, and the LED toggle is rubber for waterproofing. Jumper cables have thick red and black plastic coats, and the clamps are heavy-duty plastic with replaceable bronze inserts and large teeth for gripping. Chargers are plastic, and the 12-volt car charger has a built-in fuse. 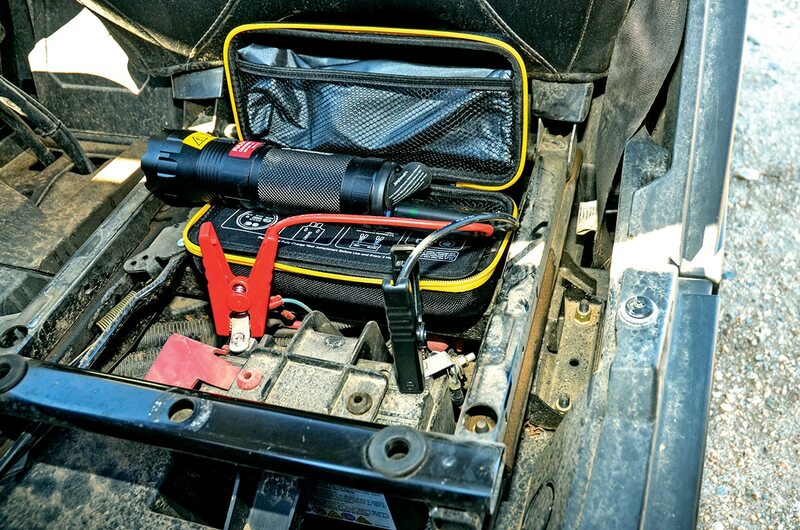 Any UTV owner who needs a multi-use tool, jump-starter and LED flashlight. The JumpSmart should be fully charged before use and every three months thereafter. We check the charge level every few rides and charge when the level lights dip below four lit. Also, after each use, make sure the main switch is turned off. The JumpSmart jumper cables are color-coded (red for positive) and have 10 levels of protection built in: reverse polarity, short circuit, over-charge, over-discharge, over-temperature, timeout, vehicle battery false voltage, vehicle engine voltage, non-sparking full and low input voltage. Jumpers have red and green indicator lights embedded in the plastic case and audio alarms to indicate protection mode. We tried the JumpSmart on a Chevy C10 with a 350ci V8, and it set off alarms for exceeding the 200-amp-starting, 400-amp peak limits. It’s recommended that you wait 60 seconds before trying a second attempt at jumping and that you never exceed three attempts, nor should you try to jump a diesel larger than 2.0L liters or gas engine larger than 3.0 liters. The SmartJump is a handy tool for troubleshooting at night, and it can save a ride with the versatile jumper cables and safety alarms. It can also quick-charge your iPhone in case problems are more serious than a drained UTV battery and outside assistance is needed, and you can signal for help on the trail with the SOS strobe.